Man Who Led Carnegie During Leaner Times Returns as Director of "Harvey"
During his decade of producing shoestring theatre in a proud but dilapidated auditorium, impresario Buz Davis could only dream of the day he might return to find that hall had received a multi-million dollar renovation, and that he was once again at the fore of creating captivating theatre there. That dream comes true this spring. Davis returns to The Carnegie in Covington as director of the 2013-14 season's final show, Harvey, the Pulitzer-prize winning comedy made famous on the big screen in a picture that starred Jimmy Stewart. For The Carnegie production, some of Greater Cincinnati's finest talent will be on stage. It runs from April 11 - 27. Director Davis pilots the production in a hall much transformed since his tenure as theatre director there in the 1990s. The balcony was condemned and piled deep with decades of refuse. A basketball would be thrown into the lighting grid prior to performances to scare off the bats. There was no air conditioning. Davis fondly recalls performing in a late summer show called “Sweat,” which included the distribution of frozen washcloths at intermission. Yet for all its flaws, more often than not audiences left the old theatre with a sense of wonder at what had been accomplished. Homemade improvements were devised, including a fly system for bringing scenery, lighting instruments and people on and off stage. The same actors performing one night would be selling concessions or running lights the next. 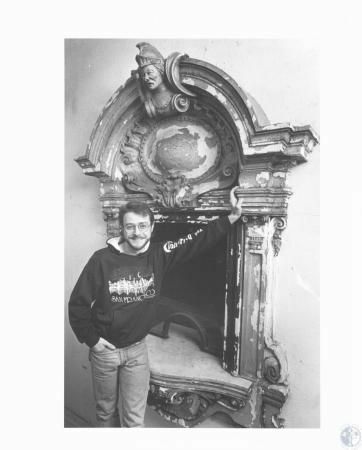 The space was an early venue for Fahrenheit Theatre Company (which later became Cincinnati Shakespeare Company). It welcomed national acts like Emmylou Harris and housed the area’s first regular series for staged readings and performance art, according to Davis. Twenty-five years and a $2.5 million renovation later, the theatre is still special, a beautifully restored and technically superior performance space that retains many of its quintessential quirks. Amid its four-year, 1,800-performance Broadway run, Mary Chase’s Harvey took the 1945 Pulitzer Prize for Drama. But as with so many stage productions, it was the film adaptation that would truly catapult it into the national consciousness. The 1950 film of the same title starred Jimmy Stewart as Elwood P. Dowd, earning him an Oscar nomination and his co-star, Josephine Hull, an Oscar win for her role as Elwood’s sister, Veta Louise Simmons. Stewart would reprise his role on stage in the 1970 Broadway revival. The recent 2012 Broadway run featured Emmy Award winner Jim Parsons (CBS’s The Big Bang Theory) as Elwood. A company of Cincinnati favorites will inhabit these starlit roles in The Carnegie’s production, led by stage and screen actor Nathan Neorr as Elwood. Cast in films with stars including Nicolette Sheridan and in several national television commercials, Neorr returns to The Carnegie in a total reversal of his nefarious role as Herr Zeller in The Carnegie’s January staging of The Sound of Music. The role of Veta Louise Simmons will be played by award-winning theatre artist Regina Pugh, longtime favorite with Ensemble Theatre Cincinnati and a nearly twenty-year veteran of Cincinnati Playhouse in the Park’s annual production of A Christmas Carol. Michael Bath makes his Carnegie Theatre Series debut in the role of sanitarium director Dr. William R. Chumley. Perhaps the area’s most demanded character actor, Bath’s resume includes award-winning credits at Ensemble Theatre Cincinnati, Know Theatre and as a company member with The Clifton Players, where he works frequently with HARVEY director Buz Davis. Rising talents and Clifton’s Untethered Theatre Company members Carter Bratton and Leah Strasser make their Carnegie debuts as young Dr. Lyman Sanderson and Nurse Kelly, who are horrified after mistakenly subjecting Veta to intensive mental therapy. Mike Hall returns to The Carnegie as the oafish orderly, Duane Wilson, along with Tom Manning (Judge Omar Gaffney) and Lisa DeRoberts (Myrtle Mae Simmons). Christina Jeans (Miss Johnson), Abby Rowold (Betty Chumley) and Martha Slater (Mrs. Ethel Chauvenet) each make their Carnegie debuts.